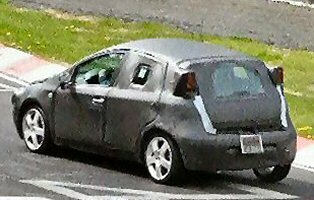 We are pleased to see that the new Punto prototypes are in evidence. Tests on these prototypes have continued all year. It appears that Fiat's recent trends towards larger wheels - as seen on the latest Punto HGT displayed at the Bologna Show (December 2004) may be available on the full range of cars. 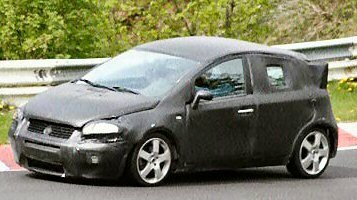 Continental rumours have this Mark 3 in full production towards the end of 2005 or perhaps 2006 for supply to the UK, and our right hand drive models.This prototype's shape is very Punto in proportion and curves. Fiat are wise to stick close to the image and brand maybe. Why mess too much up with such a successful marque? Closer review of the car - in particular the stance of the rear axle when cornering - suggests the rear suspension has been revised again. The outer rear wheel is offering more negative camber than is usual for the Punto Mark 2s. There's also plenty of duct spaces available around the front valence, to provide lots of cooling opportunities - not to mention style points. Focus on the front - and positions of the grafted on disguises - suggest we can expect quite a different look here. I still remember the pleasant surprise on first sight from the Cinquecento Sporting. So let's hope for more of the same in true Italian style. The Punto has always been a class leader in aerodynamics. The Mark 2's drag coefficient of cd 0.31-2 may well be under threat of improvement too (judging by the careful use of spoilers and front/rear edge curves combined with the new roof line). As interesting are the advances made in the small turbo diesels by Fiat. The JTD diesel has become a class leader with several manufactures looking to include versions in their own ranges. In turbo form it's probably only a few seasons before we see this diesel's torque and free revving capability actually winning races against petrol engines. Reports of the new small turbo diesel suggest this engine could be as an impressive advance as the 1242cc 16 valve sporting. 150bhp and huge fuel economy has been mentioned.